How many millions do Dundalk stand to earn from further European progress? Their recent run means the League of Ireland side are guaranteed at least €1 million. Dundalk's Chris Shields celebrates his side's progression to the next round. DUNDALK’S RECENT CHAMPIONS League exploits represent exciting news for Irish football. 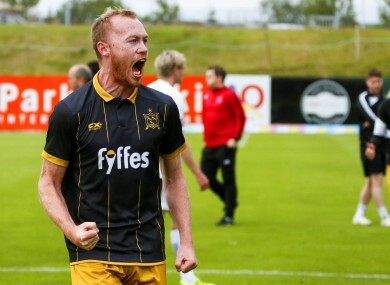 Last month’s away-goals victory against Icelandic side FH means they stand to earn a windfall of over €1 million in the third qualifying round against BATE Borisov — the second leg of which takes place tomorrow in Tallaght rather their usual home ground in Oriel Park. After losing the first leg 1-0, Dundalk face an uphill task against the Belarusian outfit, but they will know all about the financial incentives awaiting them should the Irish side pull off an upset in Dublin. So how are these funds tallied up and how much could Stephen Kenny’s side earn from further progress? The funds allocated to teams in Europe from 2015 to 2018 were confirmed in March of last year. Every team automatically gets €200,000 by reaching the Champions League first round — almost twice the fee awarded for winning the Airtricty League Premier Division (€110,000). Dundalk automatically advanced to the second qualifying round on account of Ireland’s Uefa coefficient, meaning they received an extra €300,000. By qualifying for the third round just under a fortnight ago, Dundalk got an additional €400,000. In addition, in a worst-case scenario situation whereby they lose their upcoming tie with BATE Borisov, they will still automatically be entered into the play-off round of the Europa League — they get at least €230,000 from competing at this stage. Consequently, Dundalk are already guaranteed to earn well over €1 million whatever happens. However, another progression would mean it starts to get really lucrative by Irish football’s standards at least. Beating BATE would mean entry into the Champions League play-offs — a loss thereafter would still see them rewarded with €3 million and entry into the Europa League group stages, for which they would receive an extra €2.4 million at least, as well as a further €360,000 and €120,000 for any wins or draws that they manage to secure (Cork City could also potentially go on to claim this prize money should they progress on Thursday). In the dream scenario where the ‎Lilywhites beat BATE and win their Champions League play-off, they would receive €2 million purely for winning the match and an additional €12 million for reaching the group stage. In addition, each group stage win and draw would enable them to earn €1.5 million and €500,000 respectively. Overcoming BATE will be no easy task, of course, particularly after the first-leg loss. The Belarusian champions have plenty of Champions League experience and have taken points off sides of the calibre of PSG, Bayern Munich and Juventus in the past. Moreover, they knocked Dundalk out of the Champions League in the second round last year, and will therefore go into the match as strong favourites. Nonetheless, the rewards for Dundalk if they pull off an unexpected victory are clear, as their earnings would go into the multi millions, with Celtic, Dinamo Zagreb, Red Star Belgrade and Olympiacos among the sides they could potentially meet thereafter in the play-offs. Email “How many millions do Dundalk stand to earn from further European progress?”. Feedback on “How many millions do Dundalk stand to earn from further European progress?”.